RONIN Marketing | Marketing vs. Machines - how Artificial Intelligence will..
As Artificial Intelligence (AI) has transitioned from the pages of science fiction novels to the screen-bleached pages of online publications, headlines flit between either decrying the ‘automation apocalypse’, or claiming that robots will enable humans to work less and play more. Some of the jobs earmarked for automation? Cashiers, taxi drivers, telemarketers, accountants and marketing & communications professionals. That’s right – marketing & communications professionals. As a marketing & communications professional myself, the first time I saw my occupation appear on a ’10 Jobs Artificial Intelligence Will Steal’ list, I felt a flutter of fear in my chest. Let me tell you, ‘denial’ isn’t just a river in Egypt. For a fleeting moment, I was tempted to denounce the Robot Revolution, crush my smartphone with the heel of my Vans and pledge allegiance to my Luddite brethren. For a moment. The creative industries have generally been absent from discussions concerning the automation of jobs – after all, robots aren’t capable of imagination and artistic ability, right? Well, a little bit wrong. There are machines which can create original works of art, or even design fashion. So, where does that leave the millions of creatives, now gently sweating behind their thick-rimmed glasses and under their peter pan collars? For now, AI leaves them exactly where they are, just with more time for creativity. You might be surprised to hear that communications, PR and marketing isn’t all brainstorming on bean bags, with a turmeric latte in one hand and a smashed avocado toastie in the other. In this digital age, a significant proportion of our time is spent analysing data – reams and reams of it – to ensure that campaigns reach the right people, as well as making campaigns mind-blowingly mesmerising. This is where AI can help. Using algorithms and mathematical equations, AI offers an opportunity to offload data analysis onto machines which can do it better, faster and with more accuracy. With all this newly acquired free time, marketers can focus on creating more emotive, engaging and visually spectacular content. There are specific, data-driven tasks in which a right-hand robotic man can prove invaluable. AI can be used to pull data from several sources – past customers, website traffic, forecast figures, sales etc. – to create one cohesive and coherent written report, from which marketers can create their strategy. There are AI-led applications which optimise when ads should run; by analysing the target audience, they can be timed for the lowest-priced clicks, or for highest number of lead conversion. 21st century consumers don’t want to be bombarded with ads for products which aren’t relevant – they want to see the products that they need, or ones they want. Customer Relationship Marketing (CRM) can group customers according to interests, engagement history data and even predicted future purchases to create highly-targeted and personalised ads, which prove almost irresistible. In sports and finance reporting, this already exists. These areas are dominated by stats, so existing technology generates number-driven content, with a few words spliced in-between to create ‘articles’. It’s recently spread to advertising copywriting at its most basic level, with Alimama releasing an AI enabled Chinese language copywriting tool for its products. However, creatives breathe a collective sigh of relief, because at this moment in time AI isn’t quite sophisticated enough to take your place. For example, widespread copywriting tools are still very much in their infancy. Articoolo, which claims to ‘create unique textual content in a flash’, spewed out this gem when asked to write an article on AI in marketing; “Information is among the raw material for an economics into an electronic economy’s conversion”. Unique? Yes. Coherent? No. Ultimately, marketing is about human relationships and emotive connection, which can’t be– at least for a long time – replicated by machines. However, it would be remiss of agencies to not explore how AI can be incorporated into their business model in the very near future. It’s already impacting agencies in minimal ways, and its influence is inevitably only going to increase. But we shouldn’t view it as an enemy, – we should view it as the enhancement which could be the key in unlocking marketing’s full creative potential. 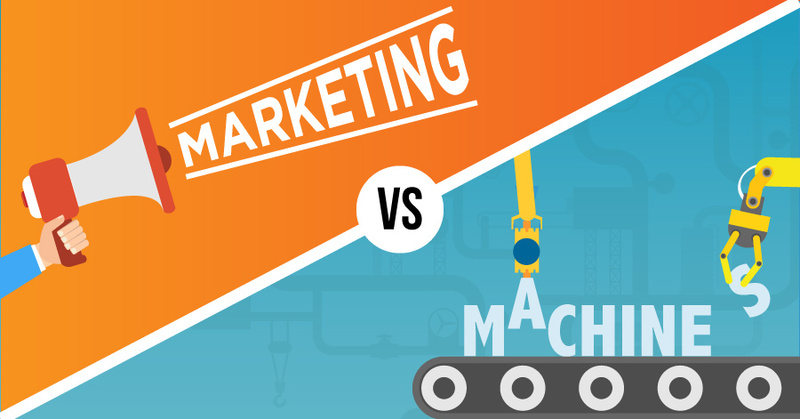 In short; we shouldn’t be worrying about marketing versus machine – we should be embracing marketing and machines. If you’d like to see why humans will always be your go-to for marketing, you can view some of our previous projects, or get in touch to discuss a project. We are on social media – find us on; Facebook, Twitter, Google+, LinkedIn and Instagram. Written by Balbina, RONIN Account Executive.